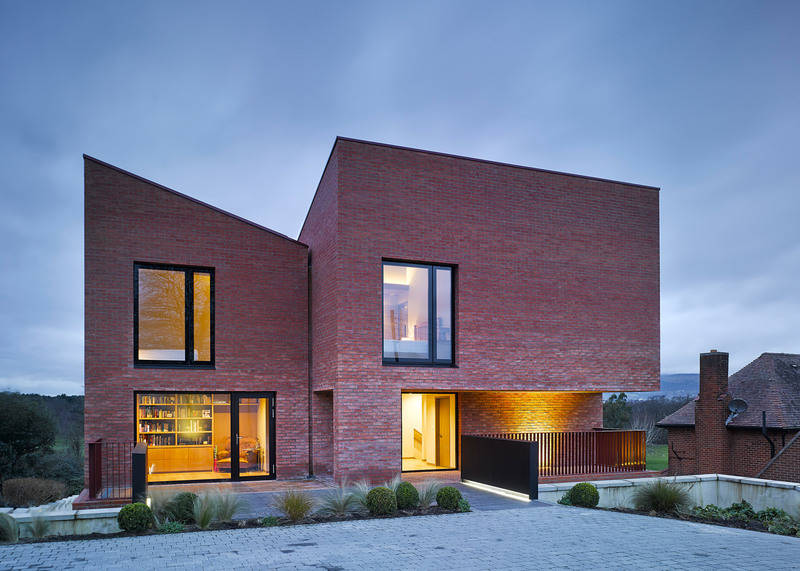 Three mono-pitched brick buildings combine to form this house in Belfast by Hall McKnight, which is arranged over multiple levels that step down a sloping site (+ slideshow). 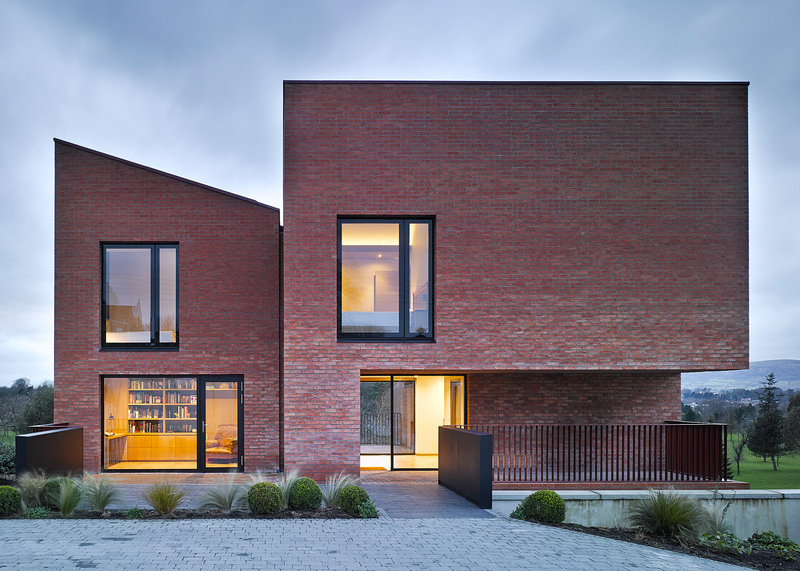 Belfast-based Hall McKnight designed the Church Road house for a family with four teenage children. They needed a large amount of space, and also wanted to make the most of views over a golf course towards the distant hills. The plot is located among smaller properties to the south of the city centre. The building is divided into three parts to make it appear smaller, plus the lowest floors are hidden from the road, thanks to the slope. Each of the three volumes is designed to give the main rooms the best views. "The massing of the house reflects the topography of the site," architect Ian McKnight told Dezeen. "The forms step down and the roof pitches orientate differently to create a sense of outcropping on the side of the slope." A wide bridge leads from the driveway to an entrance on the middle floor. Inside, a foyer offers views straight through towards a courtyard at the rear, and a staircase leads to the floors above and below. The split-level configuration of the interior creates unusual connections between spaces, which gradually step down towards the bottom of the site. "Rather than trying to provide flat, free-flowing interconnected spaces, the form reflects the idea that the owners wanted to live in a house made from distinct rooms," added McKnight. 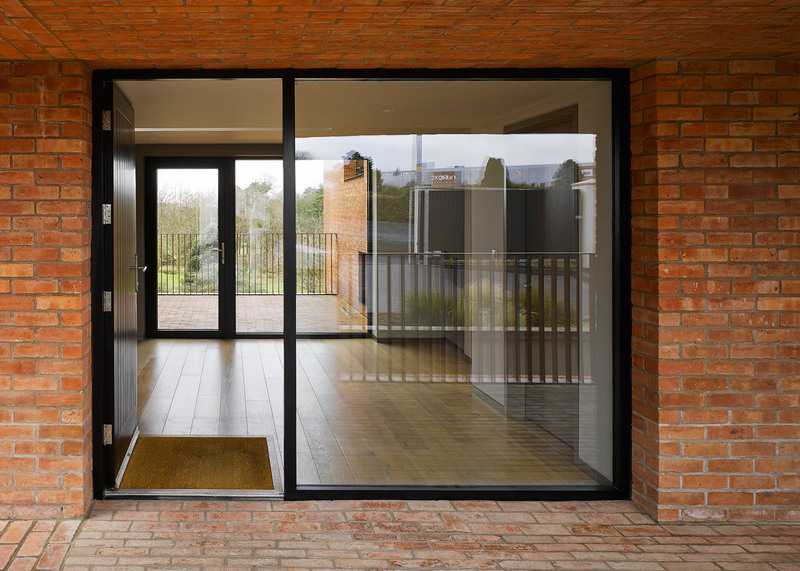 According to other British architects who spoke to Dezeen last year, this "broken-plan" approach to interior architecture is gaining popularity among homeowners seeking more privacy than is offered by open-plan living spaces. The layout of the rooms also reflects the way the family lives and the fact that the children are often not at home. By situating the main bedroom and living area a half level from the entrance, the parents can use this part of the house without needing to pass through the children's rooms, which are a further half level below. 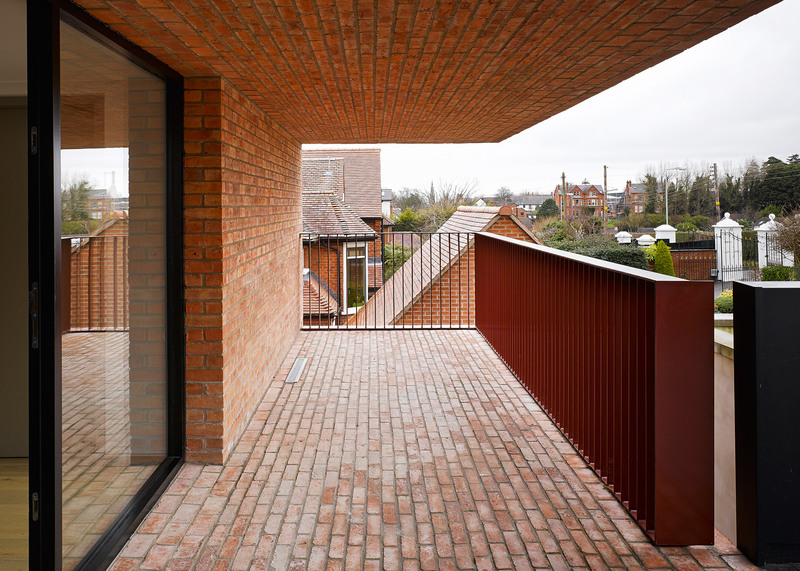 The house's exterior is red brick – the city's predominant building material. Matching clay tiles were used for the roof and windows sit flush with the brick facades, to avoid overcomplicating the simple brick aesthetic. "As the house is made of three pieces connected together, its unity is supported by the very elemental use of materials and detail," McKnight explained. "It was important to us to make the building from just two materials: clay and glass." Bay windows project from the rear elevation, intended to enhance the connection between the living areas and the views. The Church Road house is one of two new houses by Hall McKnight, alongside another house in Northern Ireland built across a narrow stream. The firm also designed Belfast's Metropolitan Arts Centre, which features a glazed tower atop a volcanic stone facade.